Stimulates microcirculation and decongest the vessels. Soothes and softens the skin with thermal spring water d'Avène. Promotes a more fresh and healthy appearance. 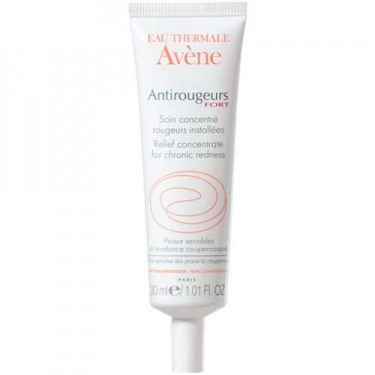 DESCRIPTION: Antirougeurs Fort Soin Concentré is an Avene anti-redness care to soothe localized redness and small vessels. This paraben and perfume-free formula improves microcirculation due to the high concentration of Ruscus extract, enriched in saponins. It helps relieve blood vessels, improving the appearance of redness thanks to its high content of dextran sulfate. Enriched with soothing and desensitizing properties of Avene thermal spring water to provide a feeling of instant softness and comfort. Apply locally to concerned areas.